permit installation of stairways of varying lengths and widths. All are of white oak wood. Budgeted manufacturing overhead costs for the year 2014 are as follows. basis of machine hours. 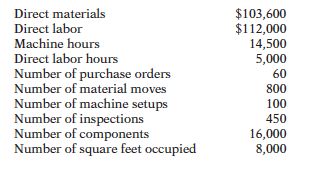 For the year 2014, 100,000 machine hours are budgeted. Bill Seagren, to implement the activity-based costing system that he has repeatedly proposed. cost drivers and their usage for the previously budgeted overhead cost pools. for the production of 250 stairways. (c) What is the manufacturing cost per stairway under the proposed activity-based costing? (d) Which of the two costing systems is preferable in pricing decisions and why?